I’m an Exumas addict. When fall days become a little too cold to get wet here on New York’s eastern Long Island, my mind starts conjuring Bahamian turquoise, and I’m ready to head south. Why the Exumas? They strike the right balance of adventure and convenience, easily accessible yet remote enough for the escapist in me. 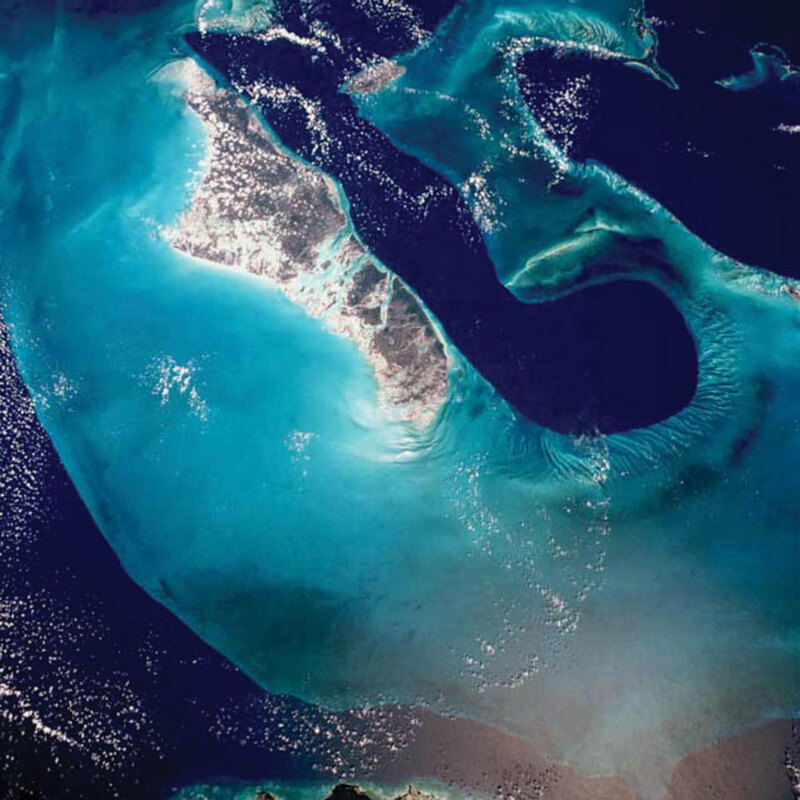 Once you are across the Gulf Stream in Bahamian waters, the Exumas are only 35 miles from Nassau. It’s easy to fly crew in and out, provision and locate spare parts. And the waters are exquisite. Because of her shallow draft, keeping this local smack upright on the wind requires hiking out on the two pry bars. 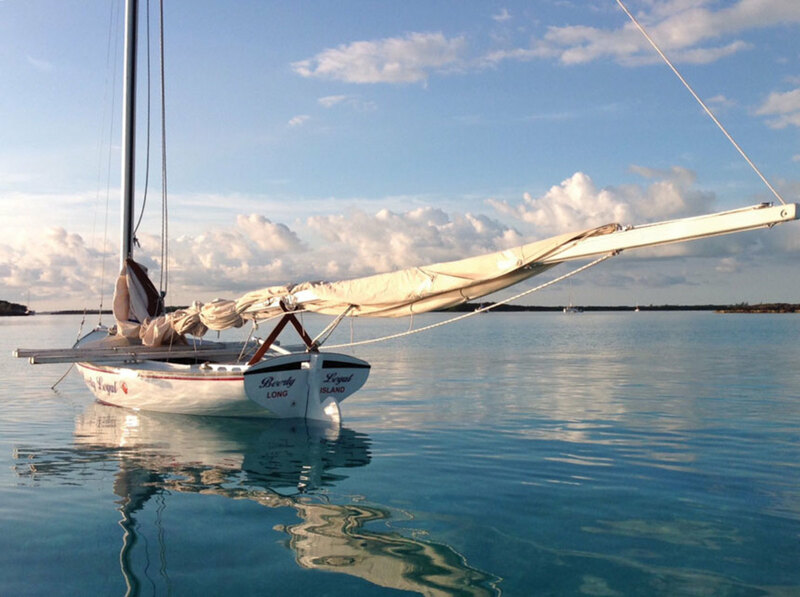 It’s believed that there are 365 cays in the 120-mile Exumas chain, which is strung like a necklace northwest to southeast in the central Bahamas. The geography is fascinating. The islands cling to the edge of a huge sand apron: There are ocean depths of 3,000 feet immediately to the east, and a labyrinth of sandbars, coral reefs and smaller islands to the west. Some cays have settlements and marinas, and others are private enclaves. Some are not much more than a bump of jagged ironshore populated only by a pair of nesting osprey. It’s hard to explore them all, even if you spend the whole winter trying. Fishing is plentiful, the water clarity is superb, and the endless shades of blue water run the gamut from teal to cobalt — a beauty that’s hard to convey with mere words. Miles of empty beaches, snorkeling, shelling, caves and offshore trolling are all within a day’s sail of a marina, when and if you want one. For me, it’s a water lover’s Eden. 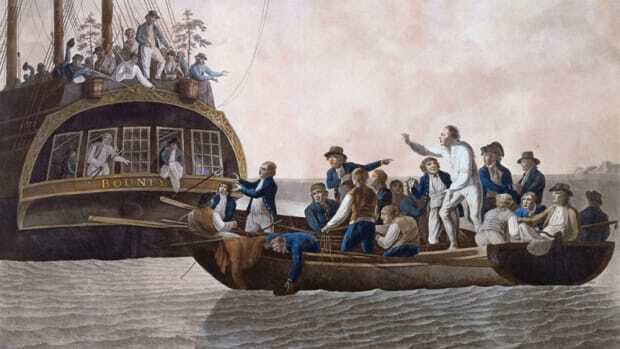 The author’s boat, Surprise, is a 50-foot ketch designed by F. Spaulding Dunbar. 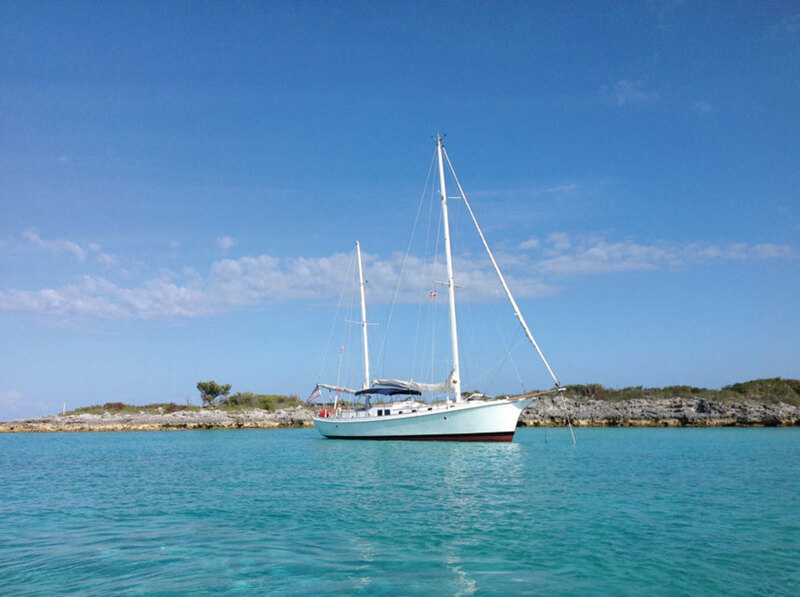 A shallow draft makes her perfect for exploring the Exumas. The prevailing winter wind is southeast, which makes for calm sailing on the Bank side. The Exumas experience the same kind of winter weather as the Florida Keys: It’s warm and subtropical until a giant cold front sweeps across the U.S. continent. A north wind can occasionally blow hard, and you will certainly welcome an extra clothing layer. There’s always advance notice, which is when everyone looks for a good lee. The other seamanship challenge is current. The ocean runs on and off the Bank with gusto every day, and in certain places the flow can be humbling. An aerial view of the Tongue of the Ocean, the deep waters that run between Andros and New Providence. I recommend the most recent edition of the Waterway Guide to the Bahamas for planning an Exumas cruise. 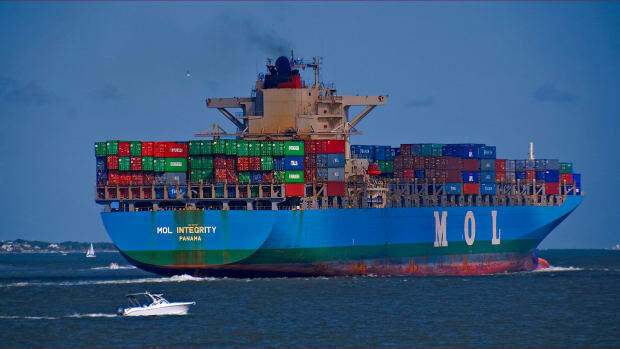 The book contains a skipper’s handbook with in-depth information on preparation, crossing the Gulf Stream, clearing in and permits, weather, tide charts and currents, navigation and anchoring, communications, reading the water, and marina and shore contacts. Florida departure is my norm, so I do thorough provisioning there, filling tanks, purchasing the latest Exumas Explorer Chartbook and making one last spare parts double-check. Then I seize an optimal weather window to cross the Gulf Stream. If the weather continues to cooperate, I make straight for Nassau to clear in with Customs and Immigration. Nassau has an international airport if you have someone flying in or out. It’s also the place to organize your Internet access. I buy a Bahamian data chip for iPad broadband so I can receive Chis Parker’s daily weather emails from the Marine Weather Center in Florida. 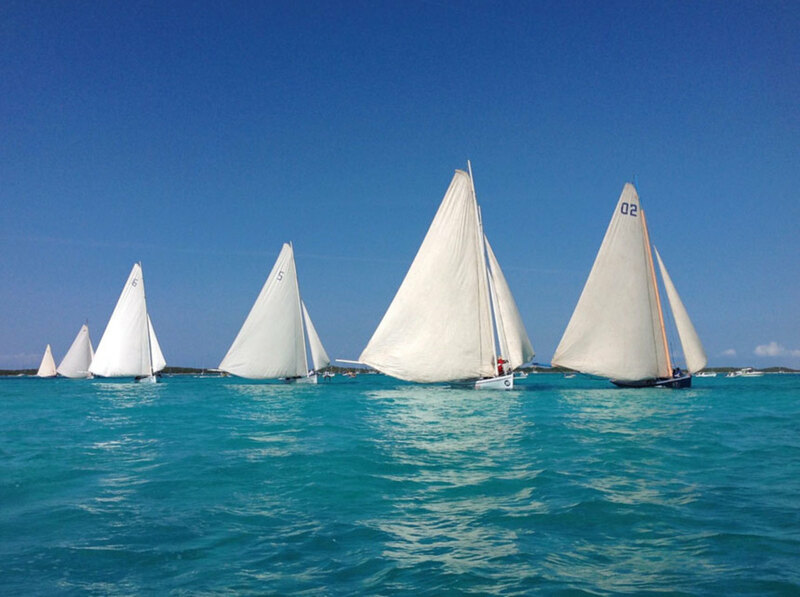 The National Family Island Regatta is held in George Town each April, drawing sailors from many other islands to race and party. 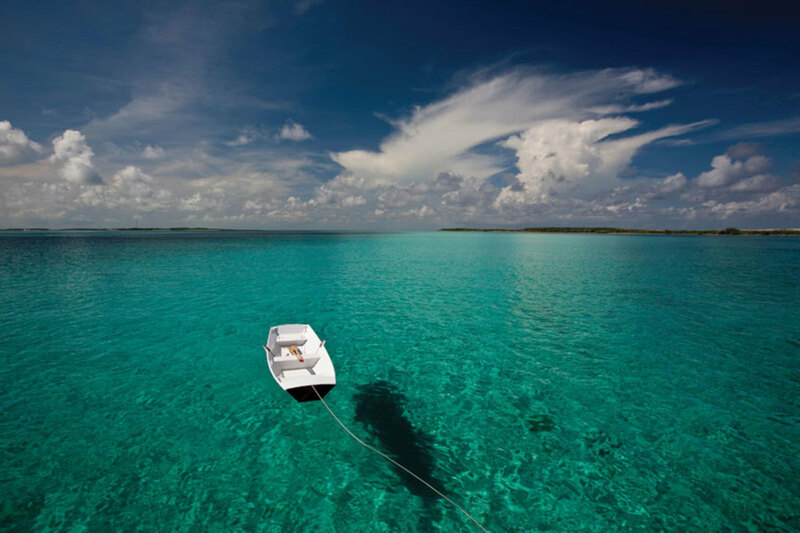 Shallow draft is key if you want to experience the Exumas intimately; you need a boat that draws 5 feet or less. 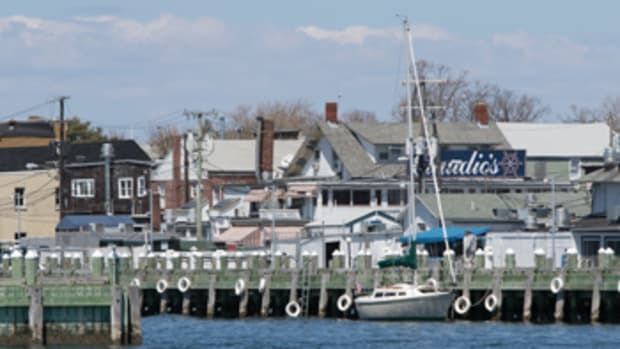 Perfectly private anchorages and the best fishing spots are abundant for those who can access them. 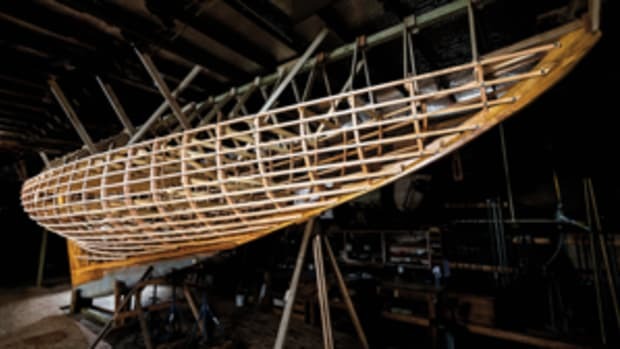 My own boat, Surprise, is a 50-foot ketch designed by F. Spaulding Dunbar. She was custom-created for the Bahamas and draws 4 feet. Knowing she’d be picking her way around coral and jogging through shifting shallows, Dunbar placed a big engine in her, with a 28-inch propeller. I love eyeball navigation, visually reading the water depth by its color. The technique is all we had in the days before satellite navigation. We studied hand-drawn sketches and descriptions, searched the limestone profiles trying to match up ranges, and judged the water depth by its color. Spotting a Clorox bottle hanging on a tree branch, a pyramid of rocks or a stake pounded into the edge of a bar with an arrow painted on it was all part of the adventure. 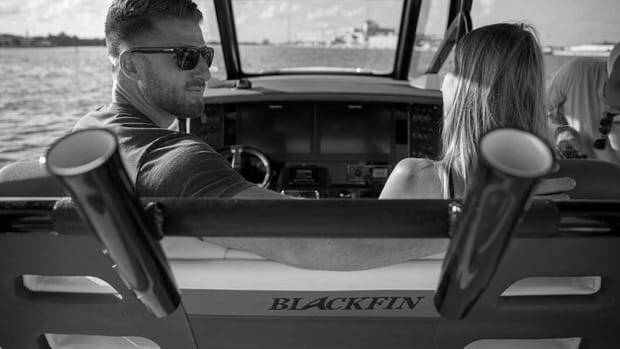 Today we use GPS, but to poke around in thin water, your eyes — with polarized sunglasses — are your best tools. If you depart from Nassau, you’ll get to try your first visual navigation skills crossing the Yellow Bank. The sun overhead or aft is best for sighting the isolated coral heads scattered across the sandy bottom. They are easy to avoid if you post a good lookout and steer around them. 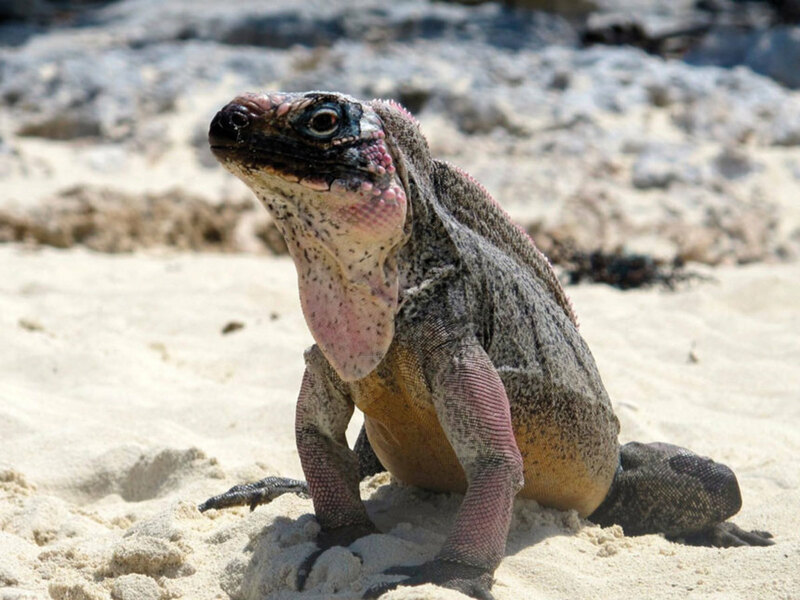 After crossing, many cruisers’ first stop is Allen’s Cay, where the iguanas officially greet you. Some like to arrive at Norman’s Cay to look at a sunken cocaine-smuggling airplane, its wings and propellers still intact. Highbourne Cay has a modern marina. Then, heading south, let the weather and wind direction inform your daily destinations. It’s easy to plan a day’s run south, either on the Bank or outside in the sound. In general, I like to run outside when we’re looking for a nice dolphin for dinner or when we choose a faster, more direct route. Either way, follow your charts carefully, apply your visual navigation and heed the information in your guidebook. 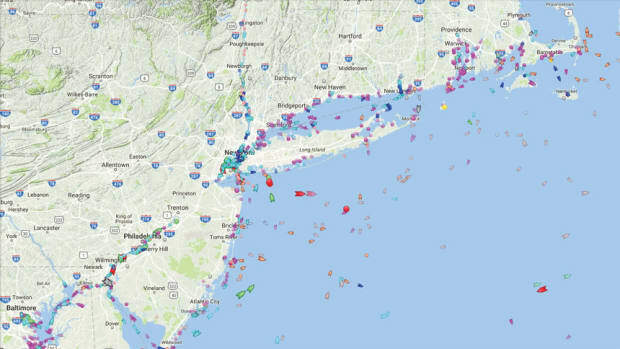 When transiting cuts between the Bank and the sound, a hard wind against an ebb current can stack up some mean seas. Plan accordingly and be prudent. An iguana hangs out on the hard. I like to disappear in Pipe Creek for long stretches. It’s just south of the park’s southern boundary. Pipe Creek is really an intricate pattern of sandbars that dry at low water, surrounded by Pipe, Little Pipe, Joe, Thomas and Wild Tamarind cays. Threads of deep water weave between the bars. I love the changing landscape as the tide rises and falls, and the drama of the bold cliffs at the cuts. A hike across Thomas Cay leads to beaches with excellent shelling on the sound side. 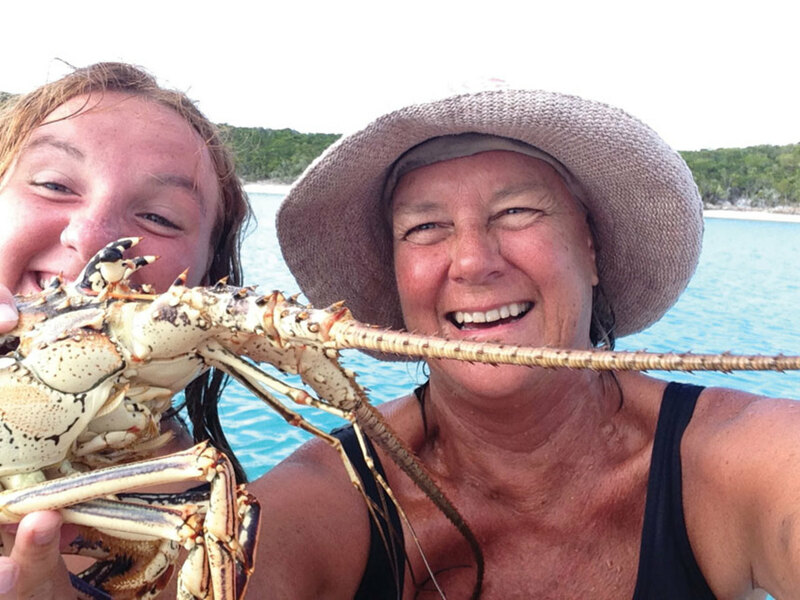 It’s a lovely retreat and a good, snug place to be in a blow; Staniel Cay is only six miles away. My advice when waiting for your next crew to fly in to Staniel Cay’s airport is to wait for them in Pipe Creek. Pat Mundus and niece Luna Crowley are happy with their dinner catch. If a meet-up anchorage suits you better, anchor at Big Major’s Spot instead. 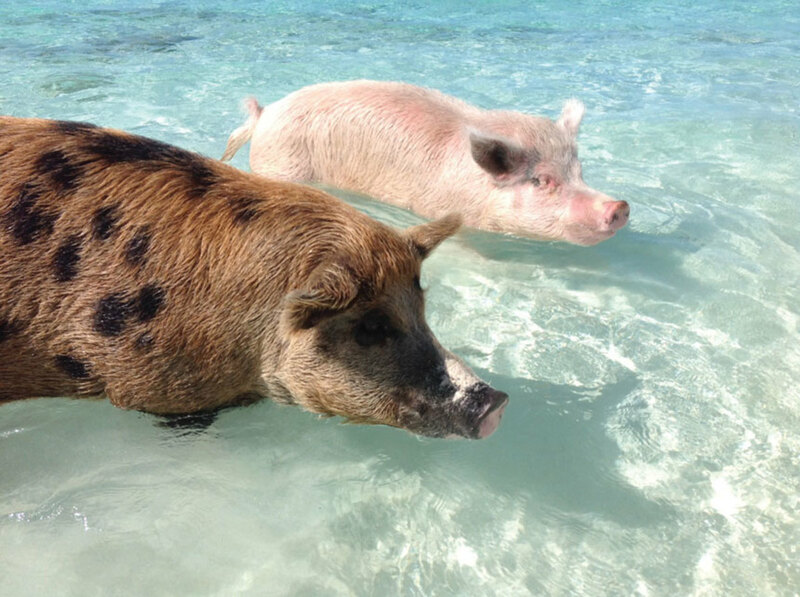 Unrelated to the social scene here are the famous swimming pigs. They do make irresistible photos, but so many visitors feed them every day that they’ve turned into aggressive, 700-pound beggars. They even swim out to meet your dinghy. Staniel Cay is the hub of the northern Exumas. 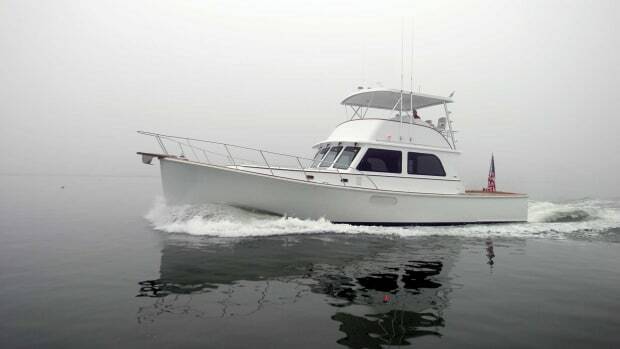 Dockage, fuel, water, daily flights and limited groceries are available. Its lively yacht club bar is a short dinghy blast to the deep-water anchorage at Big Major’s Spot. 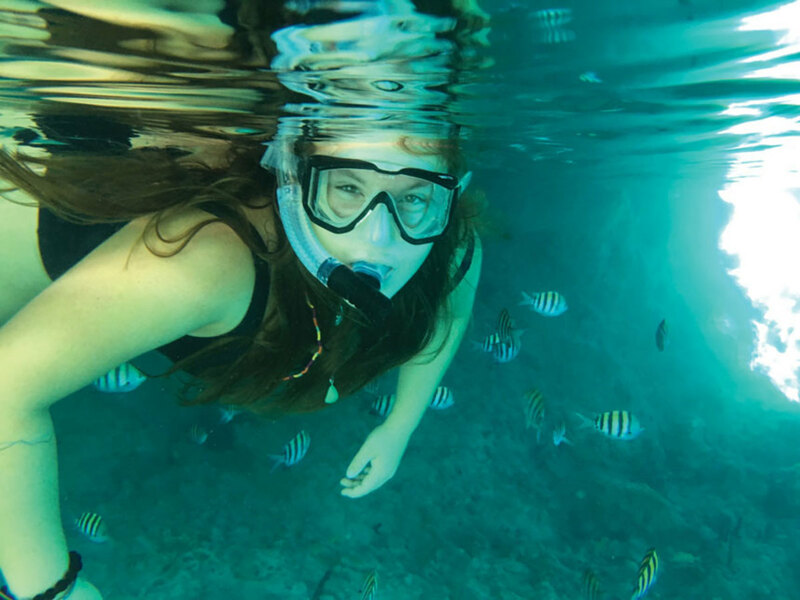 Snorkeling into Thunderball Cave is exciting. The cave is a giant air bubble inside a limestone cay that’s teeming with fish. It’s a kick no matter how many times you’ve visited. 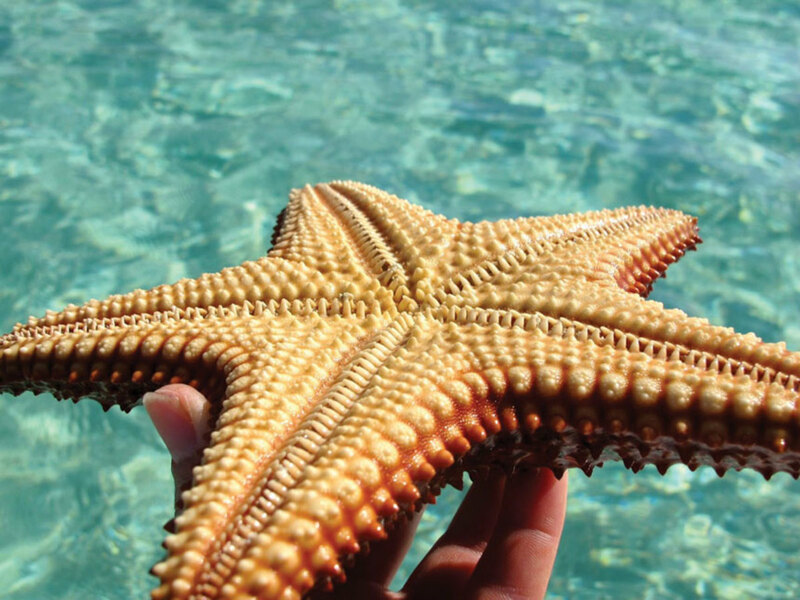 A trip to Thunderball Cave at Staniel Cay brings a different appreciation for local fish. Black Point and Little Farmer’s Cay have small, friendly settlements. Just south is one of my favorite seascapes on the Bank, a narrow, sinewy ribbon of deep water through drying sandbars, passing west of Musha Cay from Galliot Cut to Rudder Cut. From here on, the southern Exumas get a bit trickier. Many bank passages are really shallow, some possible only at high tide. This part of the Exumas is more remote, but the rewards are serene anchorages and reefs that produce more dinner. Charts in this area note “only passable in good visibility” and “shallow-draft vessels only,” but the location is some of the finest exploring in the Exumas. The annual National Family Island Regatta is held here in April. Bahamian sailors from many other islands descend on George Town with their own boats. There’s lively Bahamian smack racing during the day and partying all night. It’s an Exumas event not to be missed. Author Wallace Stegner wrote about the need to reassure ourselves of our sanity as creatures. We need a place in which we can locate our hopefulness. He called it “the geography of hope,” and it’s why I keep returning to the Exumas. Endless shades of turquoise and days spent swimming and exploring are all I really need — and, of course, a good boat to take me there. 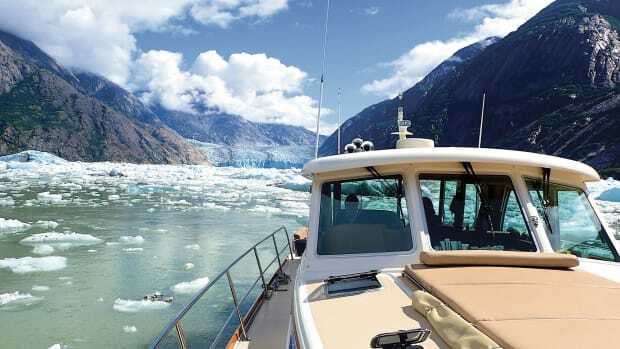 No amount of horsepower or gadgetry can compensate for seamanship skills, so it pays to get yours in order.